Marine ecology describes the interactions of marine species with their biotic (living) and abiotic (nonliving) environments. The biotic environment includes interactions with other living organisms. The abiotic environment includes aspects of the physical habitat , such as water temperature, chemical composition, depth, and current. 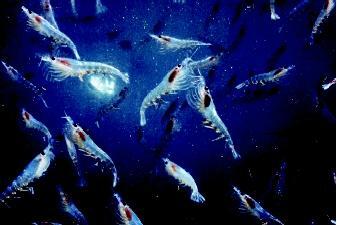 Krill, small crustaceans that frequently are found in dense swarms, are critical to the food chain in polar oceans. Marine mammals and penguins, for example, rely on krill for a major part of their diet. inorganic substances using resources from the environment and an external source of energy. Most primary producers are photosynthesizers —that is, they use sunlight as their energy source. Plants and algae are examples of photosynthesizers. Nearly all food chains are based on photosynthesizers, although a few marine food chains depend on bacterial chemosynthesizers , which use a chemical source of energy for production. Chemosynthesizers are discussed later in this entry. The next level in the food chain, the second trophic level, consists of species that eat the producers. These are sometimes referred to as primary consumers or as herbivores (plant-eaters). The third trophic level consists of secondary consumers, which are also called carnivores (animal-eaters). There can be further, higher trophic levels as well. Finally, there are detritivores and decomposers , both of which feed on dead or decaying organic matter. Much of the decomposition work in food chains is done by bacteria. Species can occupy more than one trophic level, and each trophic level usually has many representatives. Consequently, in most marine ecosystems, trophic interactions are described not by simple chains but as complicated food webs . Many species, including omnivores (eaters of both plants and animals), eat at more than one level of the food web. A pyramid of biomass describes the total amount of biomass, or weight of living matter, that is present in each trophic level. The amount of biomass decreases sharply as one moves up from one trophic level to the next (thus the "pyramid"). That is, the total weight of all the producers in a food chain is greater than the total weight of all the primary consumers, which in turn is greater than that of all secondary consumers. This is because not all the energy that a consumer obtains from food is converted to new biomass. For example, the consumer must use energy to catch and eat prey. In addition, a lot of energy is lost to metabolism and heat. In fact, only about 10 percent of the energy in one trophic level is passed on to the next level. Because of the decreasing amount of energy available in each trophic level, most ecosystems cannot support more than four or five trophic levels. In nearly all marine ecosystems, photosynthetic species represent the producers at the base of the food chain. Photosynthesis requires sunlight, carbon dioxide, and nutrients such as nitrogen and phosphorus, which are found in sea water. Although there are some photosynthetic rooted plants in shallow marine areas, the majority of photosynthetic organisms in the ocean are microscopic algae, or phytoplankton, that drift along with currents in the water. Phytoplankton are found only in the topmost layer of marine water, known as the epipelagic zone, where there is enough sunlight for photosynthesis. Because of the concentration of producers, many consumer species also are found close to the water surface. 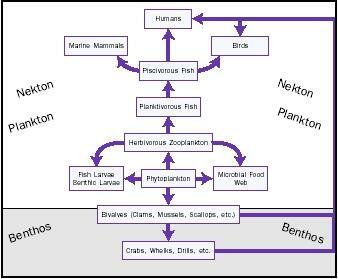 A generalized marine food web shows the feeding levels and their interconnections. The amount of phytoplankton in oceans varies across regions and also changes seasonally. For example, phytoplankton are found in low concentrations in tropical waters, where nutrients are in short supply. Phytoplankton density generally is lowest during the winter, when resources are scarce, and greatest during the spring, when levels of sunlight and nutrients increase. Spring often brings algal blooms, or population explosions of phytoplankton. Algae can be so plentiful during the blooms that they color the water, particularly if they contain red, brown, orange, or purple pigments. The amount of phytoplankton available has implications all the way up the food chain, and blooms in algae populations are often followed by increases in populations of other species. Phytoplankton are consumed by many organisms, including diverse species of zooplankton. Zooplankton are free-floating consumers and include single-celled protozoa, tiny crustaceans, and the larval stages of species such as mollusks and fish. Zooplankton and phytoplankton are consumed by the nekton, free-swimming marine organisms such as fish, marine mammals, and penguins, as well as species on the ocean bottom, including bivalves, crustaceans, and snails. There are numerous types of marine ecosystems. These include coral reefs , tidepools, polar oceans, the abyss, and others. Photosynthetic algae are the producers in coral reefcommunities. The coral reefs represent one of the most diverse marine communities—in fact, a quarter of all marine species are found in or near coral reefs. Photosynthetic algae in coral reefs have a mutualistic relationship with coral, that is, a close association that benefits both members. The algae are sheltered within the corals' calcium carbonate shells and provide nutrients to the corals in exchange. Diverse invertebrates feed on algae and in turn are eaten by reef fish, which are eaten by larger fish species. Tidepool ecosystems are ones that are alternately submerged by water (at high tide) and exposed to air (at low tide). Most of the species found in tidepools are unique to the habitat and are able to survive in both wet and dry conditions. Tidepool food webs, like most marine food webs, are based on algae. Consumer species include bivalves, snails, small fish, and sea anemones. Often the top predators in tidepools are starfish. In polar habitats, such as the oceans around Antarctica and the Arctic, photosynthetic algae also form the basis of the food chain. Algae are eaten by shrimp-like crustaceans called krill, which in turn serve as food for species as diverse as penguins and baleen whales. Penguins are eaten by seals, and penguins and seals are eaten by some whales, particularly killer whales, which are the topmost predators in the system. Kelp forests are marine ecosystems characterized by gigantic species of floating photosynthetic algae called kelp. Kelp can reach lengths of up to 80 meters (about 262 feet). A number of crustaceans feed on kelp, as do sea urchins. These are eaten by larger organisms, such as sea otters. The deepest part of the ocean, the abyss, extends to depths as great as 6,000 meters (about 19,685 feet, or 3.7 miles). These deep-sea environments are characterized by cold temperatures and lack of light. Consequently, no photosynthesizers exist, although a diverse array of detritivores feed on dead organic matter that floats down from above. There are also numerous predatory and parasitic species. Hydrothermal vents are cracks or openings in the ocean floor where hydrogen sulfide, metals in solution, and other chemical compounds escape into the sea water. * Certain specialized chemosynthetic bacteria live in these hot areas and produce organic matter from hydrogen sulfide. They form the base of unusual food webs in this specialized habitat. Chemosynthetic bacteria are eaten by specialized vent worms, clams, and mussels, which in turn provide food for octopuses and other species. The hydrothermal vent crab is at the top of the food chain in vent environments. * These unique deep-sea ecosystems are more diverse than most deep-sea environments. A feature of the ordered structure of food chains is that substances, especially pollutants , become concentrated in large amounts at higher trophic levels. This process is called bioconcentration. Bioconcentration occurs because species that consume pollutants do not excrete them but, rather, store them in bodily tissues, where they accumulate over time. For organisms high in the food chain, their prey organisms have already concentrated pollutants from multiple prey of their own, and so forth. This results in high concentrations of pollutants in species that eat high in the food chain. An issue of particular relevance in aquatic ecosystems is mercury poisoning. Mercury causes severe health problems in human and other species, including brain damage, and is bioconcentrated in the upper trophic levels. This is why people, pregnant women in particular, are often advised against eating predatory fish such as tuna and swordfish. SEE ALSO Algal Blooms in the Ocean ; Biodiversity ; Bivalves ; Cephalopods ; Corals and Coral Reefs ; Crustaceans ; Fish ; Hot Springs on the Ocean Floor ; Life in Extreme Water Environments ; Life in Water ; Marine Mammals ; Ocean Biogeochemistry ; Oceans, Polar ; Oceans, Tropical ; Plankton ; Reptiles. Barnes, Richard S. K., and Roger N. Hughes. An Introduction to Marine Ecology. Boston, MA: Blackwell Scientific Publications, 1982. Byatt, Andrew, Alastair Fothergill, and Martha Holmes. The Blue Planet: A Natural History of the Oceans. New York: DK Publishers, 2001. Lalli, Carol M., and Timothy R. Parsons. Biological Oceanography: An Introduction. New York: Pergamon Press, 1993. Nybakken, James Willard. Marine Biology: An Ecological Approach. New York: Harper& Row, 1982. * See "Hot Springs on the Ocean Floor" for a photograph of a black smoker at a hydrothermal vent. * See "Life in Extreme Water Environments" for a photograph of a vent crab.